I haven't seen too many high-quality action figures based on Edgar Rice Burrough's Mars series, but this Dejah Thoris looks pretty good, and bears a striking likeness to Lynn Collins don't you think? One of the fortuitous things about living in our times is that the internet, eBay, and used book stores provide a cornucopia of all those treasures we might have missed growing up. 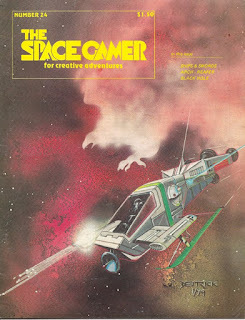 I was not aware of Space Gamer, or The Fantasy Trip RPG it prominently supported until somewhat recently. I haven't explored TFT much, except to note that stats are provided for it in the original Thieves' World campaign boxed set I happily acquired not long ago. 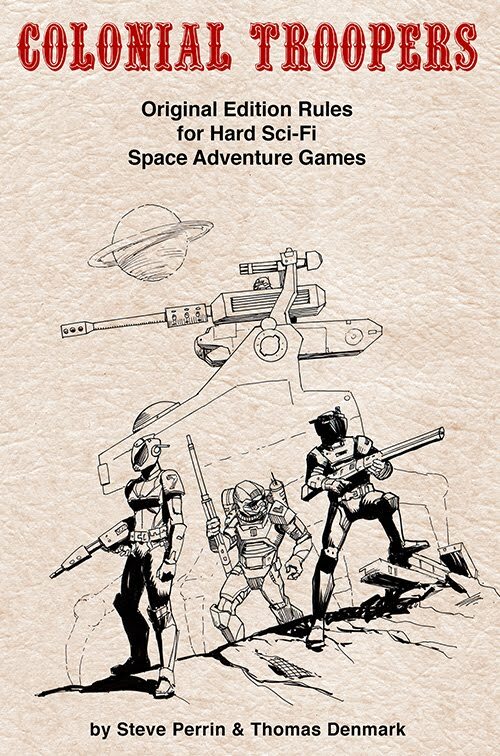 My interest in Space Gamer came when I was researching John Carter of Mars and how it had been translated into roleplaying games. 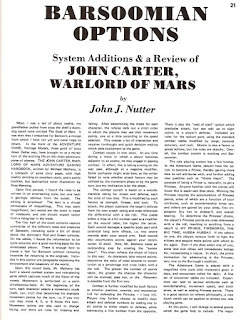 The only notable RPG was John Carter Warlord of Mars by Heritage Models Inc.. 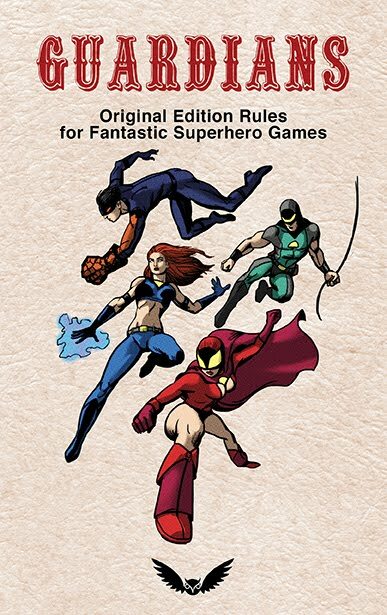 Which can only barely be considered an RPG by its cursory and impenetrable descriptions of how to play the game. 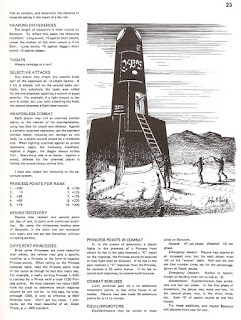 Though I guess it is inline with the original D&D which required the prospective player to be familiar with wargaming in general in order to understand how to play. 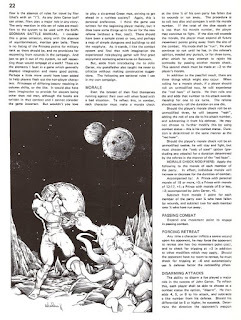 The only article, or supplement, I have been able to find for JCWoM was a brief 3 pages in Space Gamer issue #24. I have scanned in the entire article and posted it here for your enjoyment. 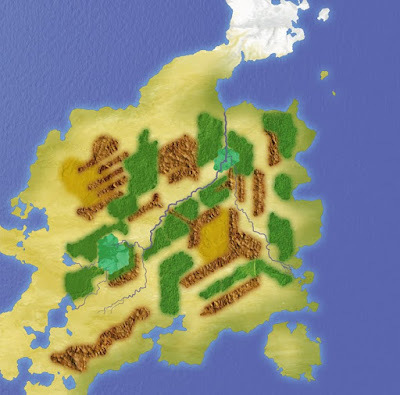 In my early days of gaming creating maps was one of the greatest joys - next to making and drawing characters, and arguing over rules interpretations (the High Gygaxian dialect didn't exactly help settle any issues). Learning how to create fantasy names for places was a natural result of the many world maps made back then. I would create multiple lists of syllables, number them, then roll dice. Getting results like: dol + mar + anth + uz = Dolmaranthuz (a name still used in my world of Dungeoneer). 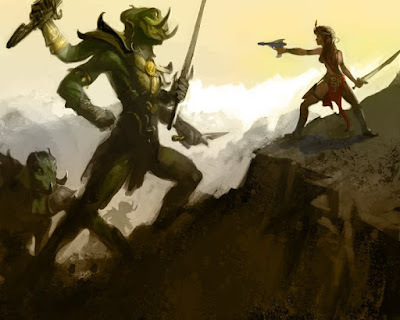 This tedious method has been replaced by great fantasy word generators online like this. So nowadays I'll just generate a couple of lists, edit them down to my favorites and get to the fun of writing up descriptions and illustrating characters, places, and things. This isn't a completely random method though. I do try to get words that sound similar and assign them to the same race/nation/place/thing for some semblance of believability. Also it helps to use real world cultures as a guide, if something sounds Nordic for example I might give it Viking or Norse properties. For the world of Lavivrus though I'd do something special. 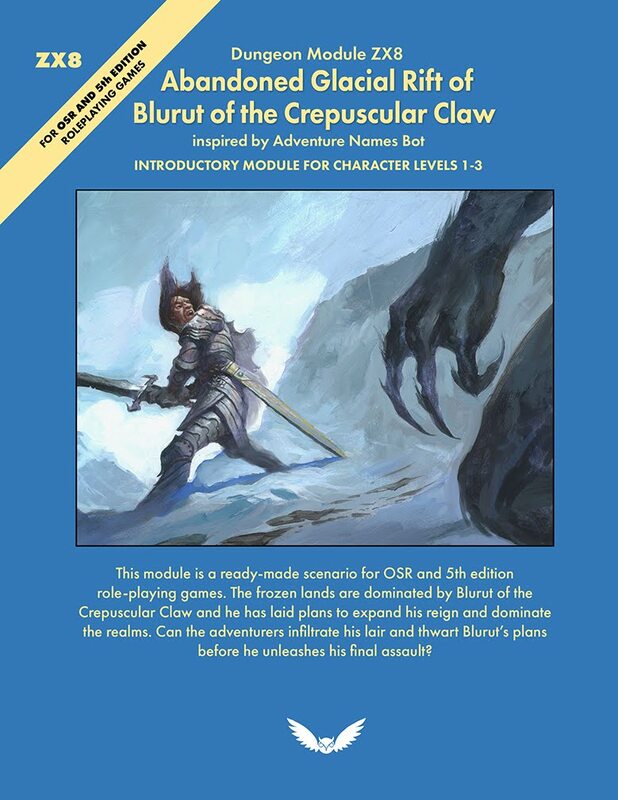 Since this is an homage to Greyhawk and Blackmoor, and those early days of yore, I thought it best to generate place names using anagrams of names of those who helped define the hobby. I went through several of my old books and wrote down many of the names of creators and collaborators. Then took those names and pulled out letters & syllables, and twisted them around into some interesting sounding fantasy names. Yes, the tried and true old school method! See how many of the names you can recognize in this list. Note: this version of the map has been revised from the last one I posted. 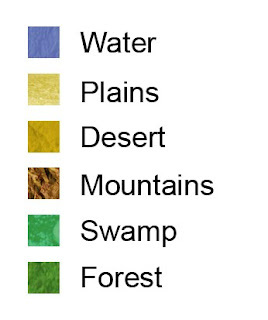 I wasn't happy with how garish the colors had turned out on the textured map, so I did a polishing pass on the colors and textures before placing these names. 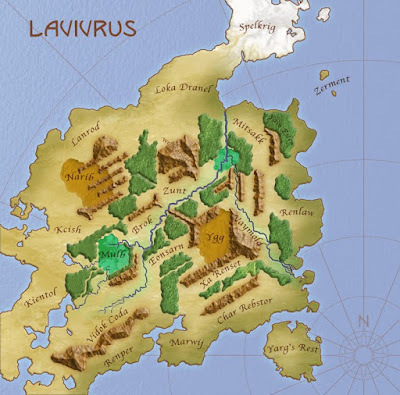 In the previous installment we looked at a technique to create interesting land masses for your fantasy world map. 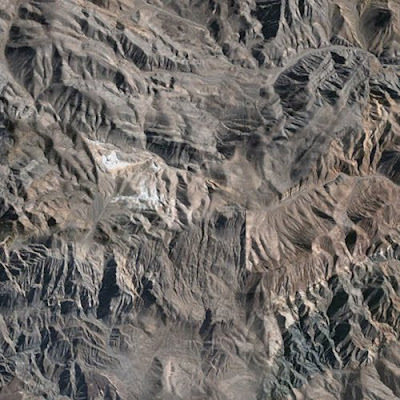 Now we'll see how we can put terrain textures on our map using Adobe Photoshop and Google Earth. One thing a noticed on a vacation to Kauai was how the eastern shore was lush, green, and moist, while the western shore was dry and desert like. This is also true of the continental US. I wonder if other parts of the world have a similar climate configuration? I chose to use this climate model on Lavivrus, making the eastern shores greener than the western shores. I softened the edges a bit on the terrain shapes, unfortunately this lost some details like those nice little forest paths, so these textures need some clean up, but it's not a bad start. Note: in describing my process I abbreviated quite a bit, because I do a lot of stamping, tiling, and fiddling with each of the textures to get them to look right. But this is something that just takes time and practice.